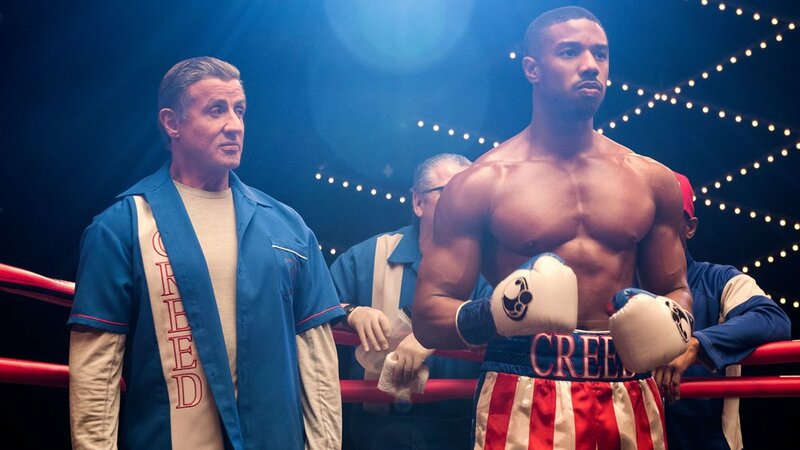 After more than 40 years, this eighth film in the Rocky universe still has a legion of people waiting to see the next chapter of Adonis Creed, but also Rocky Balboa. How good is Michael B. Jordan? Stallone is great, Tessa Thompson strong as Creed’s girlfriend, Bianca, but how good is Michael B. Jordan? The in-ring scenes are strong, the stakes feel real to the characters and to us, and Stallone (co-authoring the script) cleverly creates a mix of nostalgia with modern themes and concepts that make the film feel familiar and new at the same time. This isn’t Creed. Though very good overall, some scenes feel contrived, the in-ring action lacks the innovation of the first film, and the domestic drama increases to mixed results. No matter how good they may be, boxing movies hold zero interest to you. Curiously embraces nostalgic elements from Rocky IV, however seems aloof in understanding much of what made that film resonate with so many viewers. After feeling like Creed reinvented the contemporary boxing movie, the sequel, Creed II, struggles to match the intensity, reality, and grounded humility that made 2015’s Rocky spinoff feel so fresh, invigorating, and new. Since the first film became a massive success, Creed director Ryan Coogler has since traveled to “Wakanda” and made the largest grossing Marvel movie of all time, Black Panther. With a new director in the chair, the film feels like Sylvester Stallone’s hands are all over this. Credited as a co-writer, co-producer, and portraying Rocky Balboa for the eighth time, Stallone returns, alongside Michael B. Jordan, with new director Steven Caple, Jr. (The Land) in a film that feels rooted in the foundations that built towards the main event of Rocky IV - Rocky Balboa vs. Ivan Drago (The United States vs. Russia) in a boxing match for world supremacy. Rocky fans will remember that Drago (Dolph Lundgren) famously killed Creed’s father, Apollo, in the ring to set up the main event fight in Rocky IV. And it is those horrors from the past which will resurface in the present as Adonis Creed is now the WBC Champion, and Ivan’s son, Viktor (Florian Munteanu), the hulking heavyweight on-the-rise, has issued a challenge for the title. Away from the ring, Adonis is prepping to ask his girlfriend Bianca (Tessa Thompson) to marry him while Viktor decimates another opponent standing between him and the champ. The title fight comes, delivers a shocking ending, and leaves Adonis’ career at the crossroads. Just 28 years old, he finds himself with several decisions to make including a personal life that is evolving. From a distance, Rocky is in the background, mentoring where he can, but trying to let his former charge learn what it means to be a man on his own. Creed II is an entertaining movie, with Jordan terrific yet again and Thompson and Stallone effective in circling around our main character and giving him the space to figure things out for himself. Stallone’s screenplay, co-authored with first-time writer Juel Taylor, tattoo’s its heart directly on its sleeve, which works in ways both positive and negative. Once the melodramatic beats of the story come into play, Creed II bogs down, with family drama and introspection stepping to the forefront. The scenes of distress happening in the Creed home calls to mind parallels in the Rocky films of the past. And with Stallone heavily invested in crafting this story, it makes sense that he would go with what he knows. Unfortunately, in those key moments Jr.’s film struggles to keep the energy up. Creed II still delivers riveting in-ring action, and Stallone and Taylor find some clever ways to tie this generation’s Creed and Drago together, as their connections grow increasingly pronounced as the story rounds into focus. Creed had the element of surprise and cautious optimism on its side when it impressed so, so many in 2015. For the sequel, Caple Jr. works hard to obtain a film of ultimately lesser impact. With that said, while the breathtaking cinematography from Maryse Alberti is absent here, multiple-time Emmy nominee Kramer Morgenthau captures a distinctive look and feel for this story. Additionally, Jordan and Munteanu’s ability to generate chemistry in the ring makes the final act of Creed II something worth celebrating. A step down in many ways from its predecessor, Creed II is still a solid and worthy sequel. Because Jordan and Thompson are such a strong and relatable couple, Stallone can effortlessly slide back into the Rocky Balboa skin with ease, and we accept all of it, if any, questions asked. By the end, Creed II leaves the door open for a potential third entry in the franchise. And while Stallone could back away from so much soap opera and on-the-nose dialogue if he is involved in writing the next film, his ability to stir up emotions and get us whipped into a frenzy remains just as strong as ever when it comes to the worlds of Rocky Balboa, and now, Adonis Creed. Starring: Michael B. Jordan, Sylvester Stallone, Tessa Thompson, Phylicia Rashad, Dolph Lundgren, Florian Munteanu, Russell Hornsby, Wood Harris, Milo Ventimiglia, Andre Ward, Brigitte Nielsen, Jim Lampley, Max Kellerman.